"Not in our 1-acre zone!" So said neighbors near the corner of Settlers Trail and Locust Hill Road who don't want to see the former Knobel Brothers hardware store turned into multiple units of senior housing. 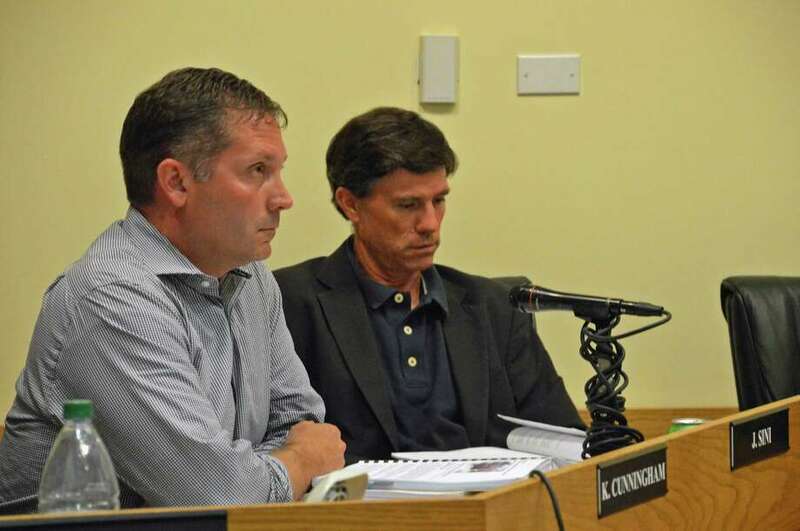 The Darien Planning and Zoning Commission conducted a public hearing Tuesday on a proposed amendment to its R-1 Residence Zone, which would create an overlay zone to allow multi-family age-restricted developments in some 1-acre-zoned locations throughout town. Applicant Penelope Glassmeyer, who owns 40 Locust Hill Road, would like to see around seven units of affordable housing for seniors on her 3-acre property. "Our objective here is to create an overlay zone for what you would call empty-nester folks," Robert Maslan, Glassmeyer's attorney, said. Residents would have to be age 62 or older to be eligible. "It gives them an opportunity to stay in Darien. They don't have to go elsewhere for the purpose of nice quality, downsized homes as they get in their later years." Noting that Darien has a lower percentage of senior housing compared with the rest of the state, yet a need exists, Maslan said, "This is a nice way to deal with that particular market." While several commissioners expressed their approval for the proposal, several neighbors were opposed. "In our neighborhood we have a 1-acre restriction ...," Jennifer Pride said. "It's not supposed to be anything different than that, (but) it's being thrown out the window, which is very disconcerting to me." Pride and others noted the area was a family neighborhood with many children, and not conducive to senior living. "It's sort of a strange place to design a place for empty nesters," she said. "We are very loud," Shana Hurkala said. "It's not a senior citizen-type situation. "I don't want to say not in my backyard," she said, "but there has to be some sort of opportunity as a neighborhood to say what is appropriate for our neighborhood." In speaking favorably of the zone change, commissioner Richard DiDonna said, "The pre-existing use was a hardware store, so this would be an improvement." Hurkala and others said they expected -- and in fact desired -- some form of development, including another hardware store. "But what we do need to consider (is) why we need to max out the units in the space," said Hurkala, adding that even large house constructions -- "McMansions" -- at least conform to the regulations. "But your basic objection is not to McMansions," DiDonna said. "It's to senior-citizen living." "Yeah, I don't have an objection to McMansions," she said. Several neighbors, including Eric Whitney, said the motivation for the proposal was financial and that the commission shouldn't implement the overlay simply to pad the pockets of developers. "I don't think it's any coincidence that it's incredibly more profitable for a developer," Whitney said about allowing increasing the number of permitted units. "I respectfully submit that it is not a limited adjustment to the R-1 zone," he said. "It represents a wholesale abandonment of the central premise of our zoning ... one home per 1-acre tract, single family. Both of those would be completely abandoned in the overlay." Commissioner John Sini noted that the benefit of the zoning overlay spoke to the Town Plan of Conservation and Development, which encourages opportunities for various kinds of housing in Darien. "It's somewhat tied to affordable housing," he said. "This project, if brought forward, would bring benefits ... outside of padding the pockets of a developer." "As a commission, we're very sensitive to the need," he said, noting that the commission remains open to ideas that can help foster solutions. "There has been a need expressed ..." he said. "How we do that is what we're struggling with as a commission." He added, "I just want to make it very clear that this has nothing to do with enriching somebody." After the public hearing, which was continued to July 10, Glassmeyer said money was not her motive. "I'm really only doing this because I feel like I'm destined to do it," she said. "It's definitely not to make money." P&Z Chairman Susan Cameron said, "I have to be honest with you, I commend Penny (Glassmeyer) for coming up with what I think is a very creative idea. "I'm totally supportive of an overlay of some sort because I think we need this kind of housing."